You died for God, and creation trembled. 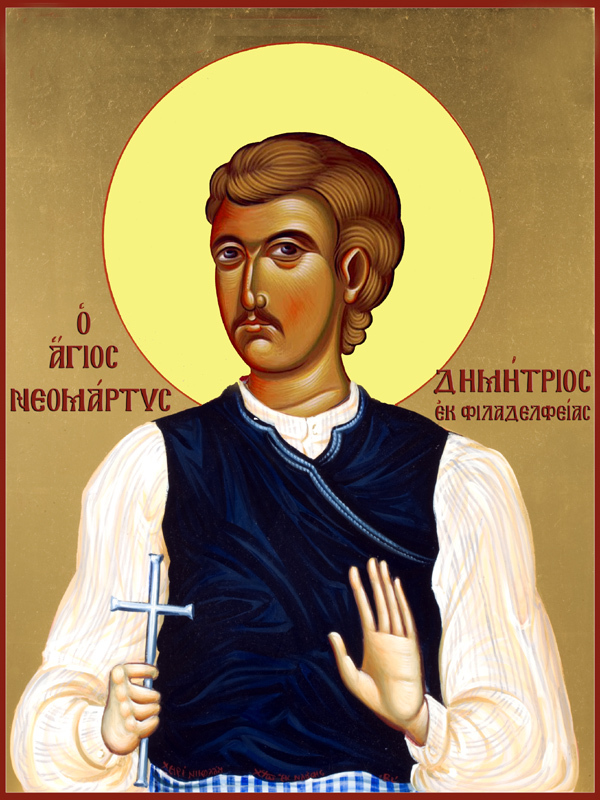 Demetrios, the newly-appeared Martyr of Christ was born in Philadelphia of Asia Minor and was a member of one of the city’s most illustrious families, being the son of Doukas the priest. Upon his father’s death, his mother undertook to rear him in the instruction and admonitions of the Lord until his eighteenth year. Since the youth was modest by nature, handsome in appearance and gifted, certain Hagarenes took undue notice of his comeliness and, motivated by malice, seized him. Now either through trickery or promises of gifts and honor, or perhaps by threats of torture, they persuaded the immature Demetrios to renounce Christ. Wherefore, he was turned over to the service of a leading Hagarene of Philadelphia. He attained considerable favor with this Muslim, so much so, that within a few years he acquired esteem, honor, and wealth, including livestock and property. Furthermore, since he was courageous physically, he was elected Commander-in-Chief of the city’s militia. By virtue of these achievements, he also became engaged to one of the foremost Muslim maidens of Philadelphian society. With this firm resolve and armed by the grace and power of the Holy Spirit, he hastened to the contest of martyrdom. They could not endure to behold the Martyr risen and speaking. They stabbed him three times in such away that the knife penetrated from the back through his chest. Notwithstanding, the Martyr of Christ did not surrender his spirit, but was kept alive by Divine power. The executioners could not tolerate the sight of him so they struck the Martyr with a rapier, severing the calves of his legs. This time, Christ’s athlete finished his course and attained the crown of martyrdom on the 2nd of June in the year 1657. Quickly the Hagarenes collected wood and coal from a bathhouse and set fire to it, and into the conflagration they heaved the Martyr’s body. Lo the wonder! The fire divided into two and did not threaten the Martyr in the least but left him intact and whole. Yet even beholding this marvel their stubbornness increased, and they took five earthen jugs of oil and poured them over the flames. Yet neither by this attempt nor any other contrivance, would the flames be goaded to come in contact with the Martyr. Finally they were at a loss at how to accomplish their heinous deed. In desperation they poked at the wood in the fire, and with the iron implements and accessories of the bath, they hacked the struggler’s relics into pieces. After his death the sacred relics performed, and continue to work, many miracles for those who approach them with faith. By his intercessions may we too be made worthy of the Kingdom of the Heavens. Amen.